Girls In Peacetime Want To Dance is the long-awaited follow-up to 2010's Write About Love. Produced and mixed at Maze Studios in Atlanta by Ben H. Allen III, best known for his work with Gnarls Barkley, Animal Collective, and Raury, among others, the band — who have been listening to things like vintage Detroit techno and Giorgio Moroder — have brought a dance-party element into their gorgeous tales of sensitive souls navigating a world gone awry. It is perhaps the most inspired and wide-reaching album Belle and Sebastian have ever made. Given that band leader Stuart Murdoch has openly declared himself pro-bubblegum before, it shouldn't come as a surprise that "Enter Sylvia Plath," "The Book Of You," and "Play For Today" have keyboard hooks that recall Scandinavian pop machines past and present. The filmic loves, kitchen sink imagery and baroque touches are still there, too, don't worry. It's all about trusting in the restorative power of pop music. 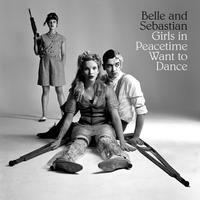 If you'd trust anyone to write a great Europop song about Sylvia Plath, you'd trust Belle & Sebastian.